The loose mineral pigments are purely natural, without additives. No oils, perfumes, talcs or alcohols. They are free of traditional ingredients that can irritate the skin or clog the pores. The minerals are naturally anti-inflammatory and act as an antiseptic on the skin, soothing and keeping the skin clean. The minerals overlay onto the skin and form a protective barrier from the onslaught of environmental pollutants. Face Primer SPF 20 fills lines and wrinkles while setting the stage for seamless make-up application. Sunforgettable Mineral Powder Sun Protection SPF 30 keeps skin healthy and provides very water resistant UVA and UVB sun protection as it smoothes and mattifies. Mineral Foundation SPF 20 is a powder formula that feels as smooth as cream and does not dry the skin. It can be layered for a flawless finish. Setting Mist keeps your make-up and sun protection in place while hydrating your skin. Use throughout the day to revitalize your look. Bonus! Mini Kabuki Brush provided for use with the Sunforgettable Mineral Powder and Mineral Foundation. 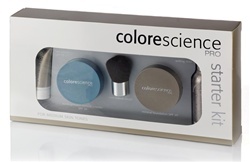 The Colorescience Starter Kit is available in different shades to ensure the products perfectly match your skin type. Available now in Santa Barbara at Evolutions Medical Spa for $60. Schedule a complimentary mineral make-up consultation at Evolutions today – 805-687-0212.